Ever feel overwhelmed with making your Thanksgiving dinner? Make this year’s feast a creative, and easier, affair by involving your kids in the holiday meal prep. Since roasting a turkey is a little too advanced for the younger ones, we’re in the kitchen with teen Chef Zane for this week’s two minute cooking class. She’s teaching us a teen-appropriate thanksgiving recipe that is not only easy to make, but is also fun to eat! 2.Place the bread cubes on a baking sheet. Bake for 15 minutes, stirring a few times. Let cool. 3.Place the bread cubes in a large bowl. 4.Increase the oven temperature to 350 degrees. Spray a muffin tin with nonstick spray. 5.Sauté the butter, onion, and celery until softened. Stir in the garlic, salt, pepper, and sage. 6.Stir the vegetables into the bread cubes. Whisk together the eggs and chicken broth. Pour over the bread cubes and veggies. Stir until everything is soaked in. Stir in the fresh parsley. 7.Spoon the mixture into 12 muffin tin cavities. Bake for 35-40 minutes. Let cool in the pan for 10 minutes, then loosen with a knife. Remove and serve hot. 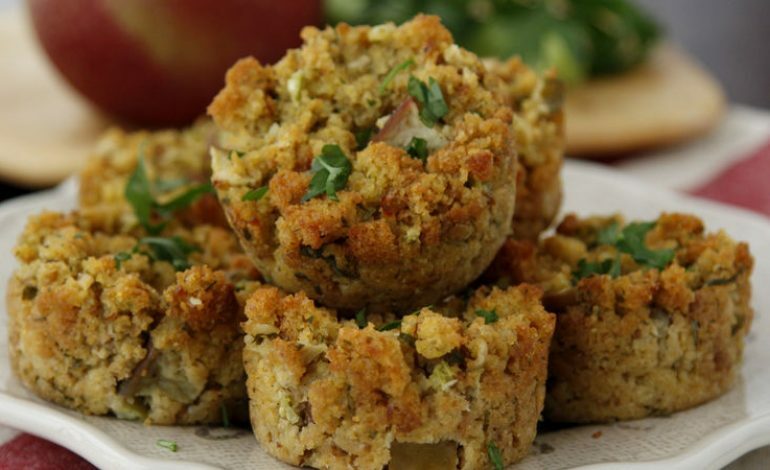 *Reduce the amount of chicken broth if you like your stuffing drier. **You can also spoon the mixture into a baking dish and bake it this way.